OK, the catch here is that the article is from November 1949 in which the magazine ranked 46 watch brands in order of their quality and reliability. Consumers Union, the parent organization of the magazine which conducts the actual product testing, did not actually test the watches, but rather surveyed a single "competent watch expert" to rank various watch brands, from best to worst, based on his experience. The results are anything but scientific (CU would not even publish such an article today), but it sure makes for interesting reading. Not surprisingly, Patek Philippe, Vacheron & Constantin, and Audemars Piguet, were ranked first, second, and third, respectively. But the next 43 brands present an interesting snapshot of one "expert's" opinion that could easily have been debated at the time, and certainly would be debatable today, given which brands are most desired by collectors, versus those brands that have disappeared into obscurity. For example, C.H. Meylan, and Touchon ranked fourth and fifth, and today are virtually unknown except for a select group of collectors who are into obscure high-end brands. The first American brand that made the list was Hamilton, at number nine. Elgin was next, at number 18, and Waltham didn't even make the list. Lonville, which distributed watches with inexpensive 7-jewel Swiss movements, came in last. Benrus and Helbros, generally considered the bottom of the heap by most contemporary collectors, ranked above such brands as Buren, Mido, and Croton. Automatic, or self-winding, watches, by the way, were deemed "unreliable" by Consumers Union. I think more than anything, this 1949 article in Consumer Reports is a testament to the power of advertising. It has been said of Rolex that they are a company which produces a fairly good watch, but has the best marketing department in the world. Ask most any American to name a quality watch, and they will say Rolex. I make no secret of the fact that I don't hold modern Rolexes watches (those made after 1960) in very high regard. I have nothing against them; I just find them boring. But I will concede one undeniable fact: If you find yourself down and out in most any city in the world, Rolex is the watch you want strapped to your wrist, because there isn't a pawnbroker in the world who would deny you a loan on that watch if you needed food in your belly or a plane ticket home. If "watch-as-commodity" is your goal, then Rolex is your brand! 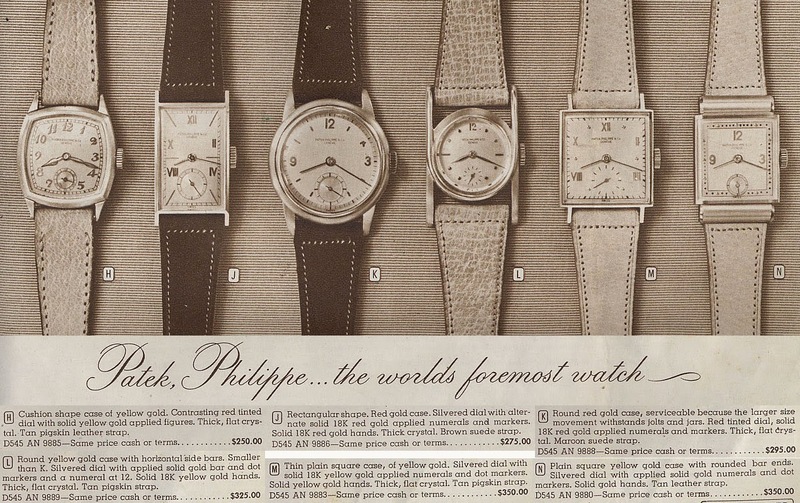 Interestingly, a primary distributor of Patek Phlippe watches in America in 1949 was Montgomery Ward, the giant catalog retailer. The Consumer Reports article told readers they could buy a Patek Philippe watch starting at $350 from Wards. I could scarcely believe it, but a friend of mine owns a 1943 Wards catalog, and there on page 475 are six Patek Phillipe men's wristwatches in 18kt gold, starting at $250! At a time when a good quality watch could be purchased for around $40, this was certainly a lot of money. But think what those watches would be worth today! Anyway, the article in Consumer Reports provides food for thought. Incidentally, the next time the magazine rated men's wristwatches was in 1958, and this time it appears CU actually tested the watches. Again Rolex was missing from the list. The highest recommended watch was a Croton Nivada Grenchen, a brand which had previously ranked 36th among 43 brands as "reliable." The watch was an automatic watch to boot, so CU's opinion of automatic watches had obviously improved since 1949! Thanks to Tom Jeswald, of the Northern Illinois Watch & Clock Collector's club, for bringing this article to my attention. His more complete story is currently under editorial review at the NAWCC, and hopefully will be published soon! Atlantic "Stop Chronograph" Fun at a Fraction of the Price of an Omega "Chronostop"
"We're All Mad Here ..."
Join my mailing list and be among the first to know about new watches added to my website!